It was nearly midnight and I needed something to eat. I had arrived in Seoul for the first time less than a week earlier and my body was still messed up from jet lag and the time difference. When I would normally be sound asleep, possibly dreaming of my next travel destination, my stomach was begging for attention. I wanted to get up early the next morning as I had always been one of those travelers to tries to plan out every hour of every day. Resting my eyes and hoping for the best would be futile. Seoul is said to be one of the world’s safest cities. I knew this and was more concerned about getting hit by a car than getting mugged. I stepped outside of my hotel without a map and headed towards distant lights. All I found were convenience stores, which were not going to satisfy me. Since adulthood, I’ve never been a lover of junk food. I walked through what seemed like blocks and blocks of empty streets. The lights that looked promising proved to be a disappointment. There was nobody on the street to ask, and even if I could, my Korean was very basic at best. After walking what seemed like a mile, I saw this dark alleyway, with a handful of locals standing around smoking cigarettes. I always hated the smell of smoke, but my curiosity outweighed my hatred of cigarette smoke as I walked closer to see what these people were doing as it was approaching midnight. I saw lights. There was obviously some sort of activity going on. One day earlier in Busan, I stumbled upon a red light district. My immediate thoughts were that I had stumbled upon Seoul’s red light district. A dozen steps later, excitement replaced my disappointment as the smell of Korean barbeque replaced the foul smell of cigarette smoke. I had stumbled upon some late night restaurants, where men in business suits and even families sat around enjoying a very late night dinner. I had been going to Manhattan’s Koreatown for years and felt like I had just stumbled upon a secret Koreatown in one of the outer boroughs. Growing up in the Northeastern United States, you were taught to never wander down a dark alley after midnight, especially if you are lost. I had never been so happy to be lost. I looked at my few options and entered the restaurant which was not empty as to indicate that nobody wanted to eat there, but not so full as to make a late dinner an all-night affair. 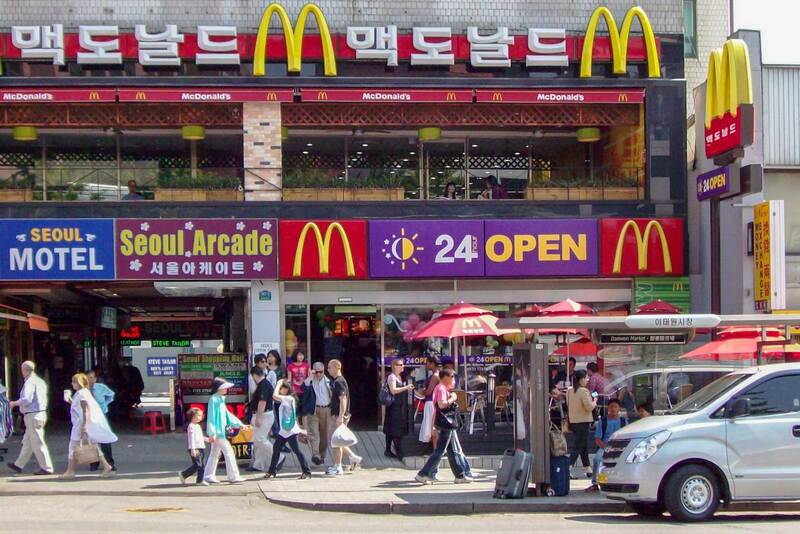 In Seoul, most signs are in the Hangeul script, but also in English. Not here! Everything was in Korean. Menus didn’t have pictures, so my only references were what I saw people eating at other tables. My server was a roughly 5’6″ thin Korean man, whose salt and pepper hair was thinning. He didn’t look like the type that would be prepared to converse in English. As he approached, I smiled at him and greeted him in Korean. Instead of smiling back, he just nodded as if to say, hurry up and place your order. Feeling like I was in a New York pizza joint, I stood up and pointed in the direction of the table next to me and used one of the few Korean expressions that I could say with confidence: “so-go-gee me-un ani-yo.” Without another word, he nodded his head made a note on his white pad and walked towards the kitchen. A feeling of pride came over me that I was getting by in a city not designed for an English speaker who spent his entire life in the English-speaking world. The table next to me had a family of what I figured were high school kids and their parents. They all sort of smiled at me and kept their conversation going between bites of steak and vegetables. I’m sure most of the people wondered what I was doing there. I can recognize the Korean language and it was definitely the only language being spoken in the entire restaurant. 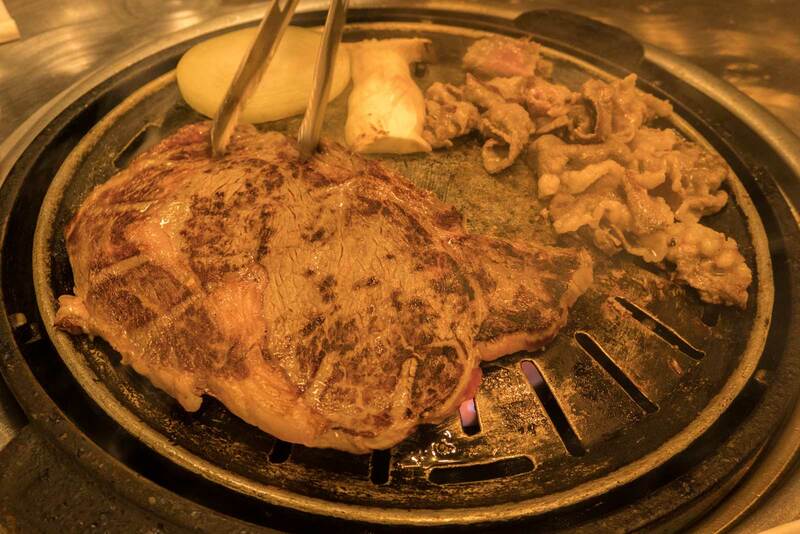 My sizzling steak with a dozen side dishes came in what seemed like no time and the experience was similar to the ones I had in Manhattan’s Koreatown. Same flavors, minus the English and other languages usually being spoken in the big apple. I can recall very little about my late night dinner except the fact that I left satisfied and didn’t get to try all of the side dishes. After dinner, I paid my bill and remembered that I was at least a thirty-minute walk from my hotel. I tried to walk back to where I started, but quickly got lost again. This time, I tried to stick to main roads. The metro stops in most Seoul neighborhoods and it proved to be my salvation, although it was not apparent immediately. I got to a metro station, pulled out my metro pass, but quickly learned that the Metro would not be running again for a few more hours. A young, well-dressed man who appeared to be at least ten years older than me said, “no more trains tonight.” As I’d learned to do when I visited Asia for the first time (the year prior), I pulled out my hotel’s business card and asked, “How do I get here?” The young man smiled and said, “You can wait for a cab, or I can give you a ride.” I was not in the mood to wait an unknown amount of time for a cab, nor did I want to sit around until the metro started running again. I obliged and thanked him for his generosity. As I entered his late-model black Mercedes, I got the idea that this was an important man. His English was nearly perfect to the point where I didn’t even have to slow down my speech or make sure I was speaking clearly. Mr. Park handed me his business card. He was indeed a government official. He asked where I was from and I said told him the United States. At that point, I had already traveled to several European countries and knew that Americans were not universally loved. Despite that fact, I could never imagine burying my head in the sand and pretending to be Canadian, as much as I love my friendly neighbor to the north. Mr. Park never asked what I was doing out at that hour and I did not feel like I had any business asking him. A couple days later, I was boarding a Korean Air flight to New York City. As I reflected on my week in Korea, my most memorable experiences were visiting the DMZ, my late night dinner, and my ride from Mr. Park. That trip was a real turning point for me as a traveler. After that, I decided that I would no longer try to plan every hour of every trip. I had to leave room for spontaneity. The word “authentic” is so overused when it comes to travel, but it still rings in my head when I think of my late night dinner and ride from Mr. Park. I dream of going there! Thank you for those tips they are really valuable! Wow, my middle kiddo wants to travel to this area when he grows up. I will have to share some of this experience with him! We dream of being able to visit all countries in Asia! There is so much to see, to enjoy and to experience from places halfway around the globe from where I live. Thanks for sharing your Korean experience! It was a fun read. It is when we are lost that we find treasures. It’s a good thing you met a man like Mr. Park who was very kind to offer you a ride. Thanks for sharing your experience. I love exploring the off-roads of Japan. You never what wonders you will discover! You found great ones in Korea!